I am responsible for the management, planning and execution of all marketing activities in Mainland Europe. My main tasks are the development of advertising campaigns and marketing effectiveness assessments, with the overall aim to strengthen our presence in the European core markets. 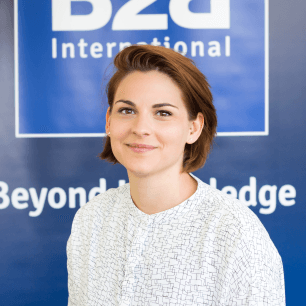 Personally, I’d consider the agile nature of B2B International as an employer as the best thing. Somebody determined to give their very best will find that the company is very flexible in delivering personal development opportunities. “Everything happens for a reason.” All things in life bring us further, even if we might not realise it straight-away. New Zealand – When I was 19, I spent a gap year down-under and worked and travelled all across this beautiful country. It was truly a life-changing experience and ultimately lead me to studying both my Bachelors and Masters degree in the UK (and not in my home country Germany) and to start a career in international business. There are so many great books, I honestly couldn’t pick THE best. The Harry Potter series, “Hundred-Year-Old Man Who Climbed Out the Window and Disappeared” by Jonas Jonasson and “Into the Wild” by Jon Krakauer are three of my all time favourites. Currently, my favourite pastime is doing Aerial Silks, an acrobatics discipline that entails a lot of hanging upside-down and falling towards the floor from 6 meters above the ground. On my less adventurous days, I love spending time with my friends and family and going to gigs.